The Seattle Public Library Foundation helps the Library build its collection and resources, offer programs for patrons of all ages, and better serve the needs of our community. This fall, The Seattle Public Library is part of yəhaw̓, a community-driven, open call exhibition celebrating the depth and diversity of Indigenous art made in the Pacific Northwest. From October 4 through December 9, the Central Library Level 8 gallery will feature the exhibit “This Is Our Home, Where We Belong,” showcasing original artwork of five Coast Salish women exploring environmental justice, identity and place. The Library and yəhaw̓ will also host a series of Indigenous artists in residence – Native Kut (Pah-tu Pitt and Sean Gallagher), Fox Spears and Roldy Aguero Ablao. The artists will each activate the right side of the Level 8 gallery and include artwork displays, live-art making, and community engagement activities, all relating to themes of water and environmental justice. All of the artists will participate in a public panel discussion following the residency period to share their experiences working in the library. Visit spl.org for artist in residence schedule. 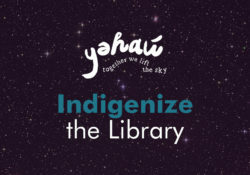 The Library’s participation in this project is made possible through donations to The Seattle Public Library Foundation and expertise from executive project producers Tracy Rector (Choctaw/Seminole), Asia Tail (Cherokee), and Satpreet Kahlon, along with the guidance from the Library’s Native Advisory Council. THANK YOU! You made Library Giving Day a massive success! © 2019 The Seattle Public Library Foundation. All rights reserved.